Astronomers looking for black holes have been baffled by the same question for decades: we've found large and small holes, but where are all the medium-sized black holes? It’s a mystery that Tal Alexander, a physics professor at the Weizmann Institute of Science in Israel, and Ben Bar-Or, a scholar at the Institute of Advanced Study in Princeton, New Jersey, US, have tried to crack. Their paper, published last week in Nature Astronomy, suggests the lack of chubby holes, as opposed to skinny and obese, could be down to the way they grow. American theoretical physicist John Wheeler was first to label the strange objects with powerful gravitational fields “black holes.” He discovered the first one in 1971. Fast-forward 46 years, and the list of known and potential black hole candidates has grown. However, to date there have been no definite detections of moderate-sized black holes – ie, those of about 100 to 10,000 solar masses. Stellar mass black holes born from supernovae, which are a few to several tens of solar masses. Monstrous supermassive black holes with masses equivalent to millions of solar masses, which sit at the center of galaxies. Research shows that most of the seeds for these black holes were sown during the early stages of the universe. 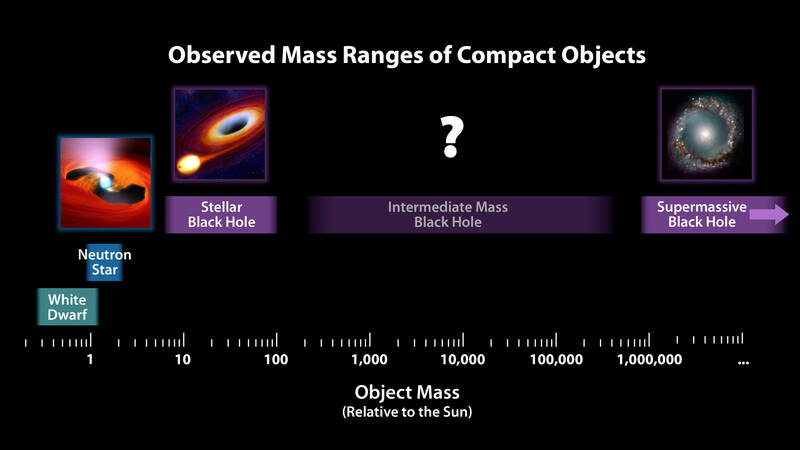 If they do indeed grow by one solar mass per 10,000 years, then most of the black holes we see today should be, by now, supermassive. The rest are likely to be small ones formed from exploding stars. But that doesn’t mean that intermediate-mass black holes don’t exist; instead, they’re just very tricky to find. “We predict that in the local universe intermediate-mass black holes will be rare. Finding them in the early universe, in distant galaxies, is currently impossible observationally. Black holes can reveal themselves by accreting gas. However, because of their small mass, the luminosity of accreting intermediate-mass black holes will be too low to observe from long distances,” Bar-Or told The Register. The best hope in finding them could lie in the emission of gravitational waves. Scenarios such as white dwarves or neutron stars falling into intermediate-mass black holes or merging with stellar black holes would result in ripples through spacetime. “There are currently no gravitational wave observatories that can detect gravitational waves emission from such mergers, and even planned missions will only reach [distances of small] redshifts. Therefore, a coalescence of two intermediate-mass black holes provides the best hope for detection – with the planned eLISA mission. If we are right in our prediction, most of these events will be seen close to their high formation redshifts (redshift ~10),” Bar-Or added.